Holidays are very different for blended families. This Thanksgiving, our oldest will be in Colorado with her cousin and grandma, three kids will be with their dad, and two will spend part of the day with us and part with their mom. Yesterday we were all together. (That sweet, tall boy in front was sick, but I'm thankful he obliged his mom for a quick family photo, and even managed a smile!) We relaxed, colored, played baseball in the street, watched football, then basketball (the Warriors are on fire! ), read, did laundry and packed. We ate a pot roast meal (which received unanimous thumbs up, a reason to celebrate in itself! ), followed by warm cinnamon rolls and orange rolls, and ended with a movie all together... Yours, Mine and Ours. We don't get to be all together on Thanksgiving Day, but we make the most of the times we are all home together and make it count. Even when we're scattered throughout the house and yard for parts of the day, there's just something about everyone being home that fills my heart. Blending two families is not easy. I knew it would be hard sometimes, but there are days I tell my husband, "I didn't know it would be this hard!" We have had so many transitions this year, which is just what we prayed for and wanted, and so even in the midst of the chaos, I stop and thank God that He did this. He saw us, He put love in our hearts for each other and brought us all together. Sometimes life goes so fast during the week, I feel like I can hardly keep up. I'm so thankful for weekends, times of refreshing, time with family, time to get a little grounded again and remember that it's all worth it. And I pray each Sunday to carry that strength with me through the week ahead. 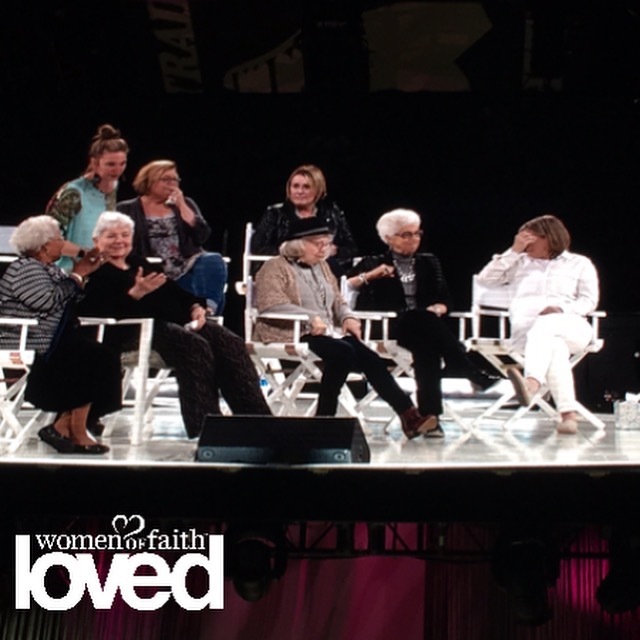 This weekend I was blessed to attend a Women of Faith conference with my daughter. I attended my first one 19 years ago, while I was pregnant with her. I'm not sure how many of these events I've gone to through the years, but this was our first one together, and it was awesome. We got there and she looked like she regretted that she agreed to come. She looked around at the white haired ladies on "the porch" and asked, "How long is this going to be tonight?" It was only a matter of minutes before we were both laughing and utterly enjoying every moment. By the end, she said she wished she'd been before and we were both so thankful we had gone. This was the first time I've heard Jen Hatmaker speak, and I have to say, I'm a big fan. She felt like a friend. In fact, all of the ladies did. They each have such a way of sharing their stories with humor and vulnerability that makes you lean in and relate. I've come to love Luci, Marilyn, Thelma, Patsy and Sheila over the years. This was also the first time I'd heard Sandi Patty. I have to admit, I've heard of her before.. My dad listens to her music. I had never really given her a chance, but when she started singing... whoa! What a powerful voice! And then she shared about her blended family, which is so nice for people like us to feel that kinship with someone. I bought her book Life in the Blender and started reading it yesterday. Great resource for anyone on a similar journey. This was the farewell tour, so I'm sad we won't be able to go again, but a new conference, Belong tour, is starting next year, and I'm excited to attend.